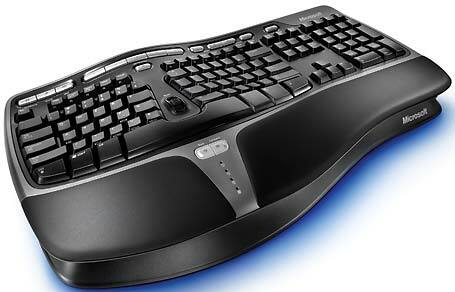 The Microsoft Natural Ergonomic Keyboard 4000 has a gentle upward curve in the middle. Javacool's EULAlyzer reads end-user license agreements and flags suspect language. Uses the same CMOS sensor as the 20D, but has a larger LCD and a spot meter. Controls are intuitive and easy to use. 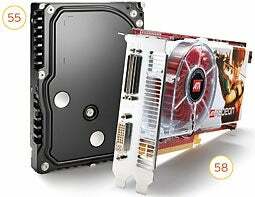 Very fast, expensive PC with two graphics cards will appeal to hard-core gamers and graphics pros with deep pockets. Fast and cleanly designed SATA drive comes with a PCI controller that provides external SATA connections. A big color LCD and two-sided printing make the well-designed iP6600D attractive. It prints high-quality photos quickly. Delivers top-notch image quality, but the autofocus behaved unpredictably, the zoom range is limited, and the price is high. This elegant model has high audio quality and native photo support. But it's pricey and limits you to the iTunes Music Store. The MP950 has a nice 3.6-inch LCD and great paper handling, and delivers quality text and photos. Scan results were mixed. DLP set aced our image-quality tests handily, and has unique, easily accessible front-mounted ports. Bright high-quality images and enhanced color capabilities justify this projector's premium price. Powerful card competes well against rival GeForce 7-series top dogs, but it'll cost you. Delivers high image quality and many controls. However, the price is high and image editing software is limited. This big display showed extremely sharp text and bright graphics, and it has plenty of media card slots and USB ports. The VisionM has a touchpad and delivers great-looking video. However, it needs a dongle to sync files. This bulky handset offers built-in Wi-Fi, so you can browse the Web and send e-mail and instant messages quickly and easily. Bright, high-quality screen and sleek, piano-black cabinet make this TV a proud living-room centerpiece. Strong performance, battery life, and keyboard make this expensive business notebook a winner. Standout LCD plus good optic and image quality, but there's no LCD status display and lens options are limited. Amp-less, lower-cost ZonePlayer for Sonos' complete home music system. Unlike the single-core 1.5GHz Intel-based Mac mini, this model is powered by a 1.66GHz Intel Core Duo chip. It also features more storage capacity and an 8X dual-layer SuperDrive. Other features -- an integrated graphics processor that shares memory with the system RAM, built-in wireless networking capabilities, and the Front Row multimedia management program -- are the same as what you get with the 1.5GHz Mac mini.